Dawson record: Phil Dawson set a new career and franchise mark for consecutive field goals, but had his streak of 29 makes snapped when Desmond Bryant deflected a 28-yard attempt late in the third quarter. His run was 13 shy of Mike Vanderjagt's NFL record. He began the day tied with his old franchise mark of 27 before converting 41- and 35-yard attempts. He said the footing near the end zone was treacherous and members of the line got pushed back, allowing the Raiders to gain penetration for the block. Dawson was just excited to see the team get the win. 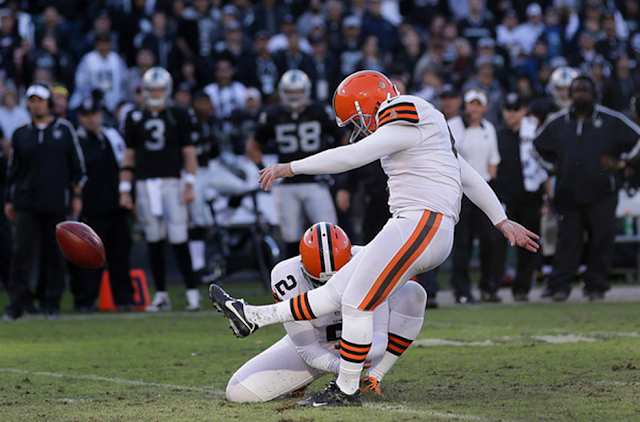 Phil Dawson kicked two more field goals, running his streak to 29 before a 28-yarder was deflected wide. The NFL record is 42 by Mike Vanderjagt. Dawson said the ground was very muddy for the blockers, and that was why the protection broke down. That probably was true, but I also like how Dawson covered for his linemen.